Popeye and Bluto are running for president; it's election day, the vote is tied, and Olive is the only remaining voter. Popeye: And don't forget, folks, when you goes to the polls today, a vote for Popeye means free ice cream for all the kiddies! With a title like that, you expect a lot more than is given. 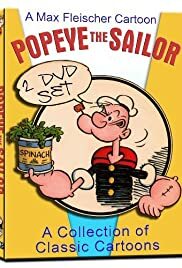 With a title like that, you expect a lot more than Popeye and Bluto helping Olive out with farm chores so she can get to the polls. How about Popeye kicking out Congress?? Single-handedly building new roads?? How about Bluto trying to frame him in a scandal?? How about entertaining us??! !